Hi [INSERT YOUR FRIEND'S NAME HERE], Please check this out https://www.proactivehealthcare.co.uk/quicksilver-scientific-vitamin-c-no-soy?referrer=0 and get £4 off your first order (minimum order £30 excl. shipping). Thanks! I am very impressed with this preparation. Overnight it solved a seriously brewing sore throat following a whole night awake with my daughter while she was giving birth. Having had not a wink of sleep, I knew I was vulnerable to my old adversary, the sore throat that then takes a hold and goes down to my lungs. So I took a dose of this liposomal vitamin C and, lo and behold, the next day I was fine. That has never happened before! Thank you Chris Shade! Your liposomal technology really is effective! I have used it a few times since then, and it has put me right, every time. What is that worth?! Quali® is a trademark of DSM. * Percent Daily not established. Take 1 teaspoon by mouth once daily. Hold in mouth 30 seconds before swallowing. Repeat to desired dosage or as directed by healthcare professional. Take on empty stomach, at least 10 minutes before meals. May be stirred into small amount of water. Apply a thin layer to clean skin (avoiding eyes) and leave on for at least 10-15 minutes. Refrigerate upon receipt. Use within 30 days of opening. 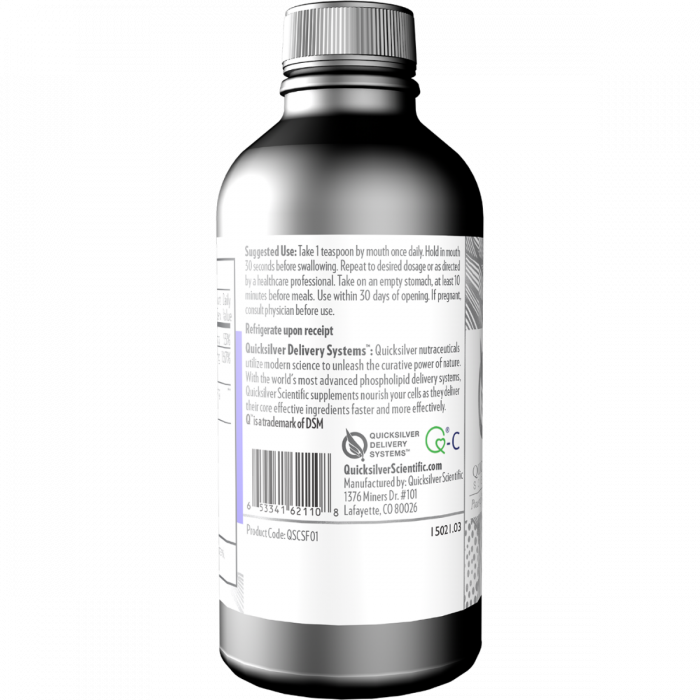 Quicksilver Scientific Vitamin C should be stored in the Fridge and used within 30 days of being opened. Whilst this product needs to be kept cool to maintain potency it will maintain potency when exposed to warm temperatures for up to 7 days. If your product arrives warm, it is NOT damaged as it was cold when it left our warehouse. We recommend that customers outside of the UK do not select standard shipping for this product. For best results keep out of direct sunlight. *This is a refrigerated product and is not eligible for refunds or replacements.